First of all, let’s prep your lemons for squeezing. Roll your lemons on the table or other working surface with the palm of your hand. This will insure that the lemons are sift and easy to squeeze. Cut your lemons in half. You can cut a few slices for garnish now and set them aside. Set a small strainer over a cup or bowl and start squeezing your lemons. The strainer will catch loose seeds and pulp. If you enjoy pulp in your lemonade, you can omit the strainer and fish out lemon seeds with a spoon later. You can also use any of the gadgets for squeezing citrus. I usually go the old-fashioned route though. Set your lemon juice aside. Combine your strawberries with sugar and water in a medium sauce pot. Start making your simple strawberry syrup on low heat stirring occasionally. As soon as the mixture heats up and starts steaming, stir constantly for another minute until it just starts bubbling. Take it off heat immediately after that. Let your strawberry syrup cool off a bit. Then place a medium strainer over a cup or a bowl and pour the syrup in. With a spoon press the berries against the strainer. All the strawberry mush will stay in the strainer leaving you with a delicious concentrated strawberry sauce. Now mix your strawberry sauce with the squeezed lemon juice until combined. 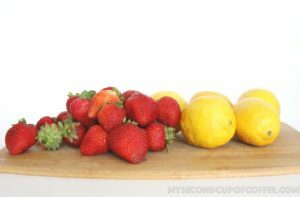 Pour your strawberry-lemon mixture into a pitcher, adding water and mixing well. Add ice. If you wish, you can decorate with a few spears of mint or strawberry and lemon slices. Summer days are long and often hot! Solve your problem of thirsting for something satisfying and tasty with this Strawberry Lemonade. 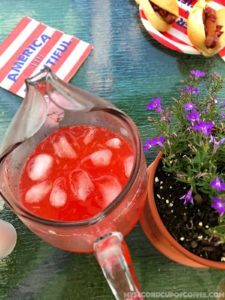 It is not overly sweet because the strawberries in it bring in the extra sweetness to the base of the old-fashioned lemonade. 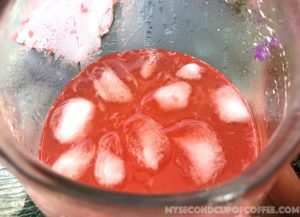 In fact, lemons and strawberries complement each other so well in this recipe, you will taste both, sweetness and tartness, all at the same time in one sip of this Strawberry Lemonade. Give it a try this summer, and let me now in comments how you liked it!